37.95 metres @ 3.25 g/t gold equivalent (BUUY410, 1,421-metre elevation). 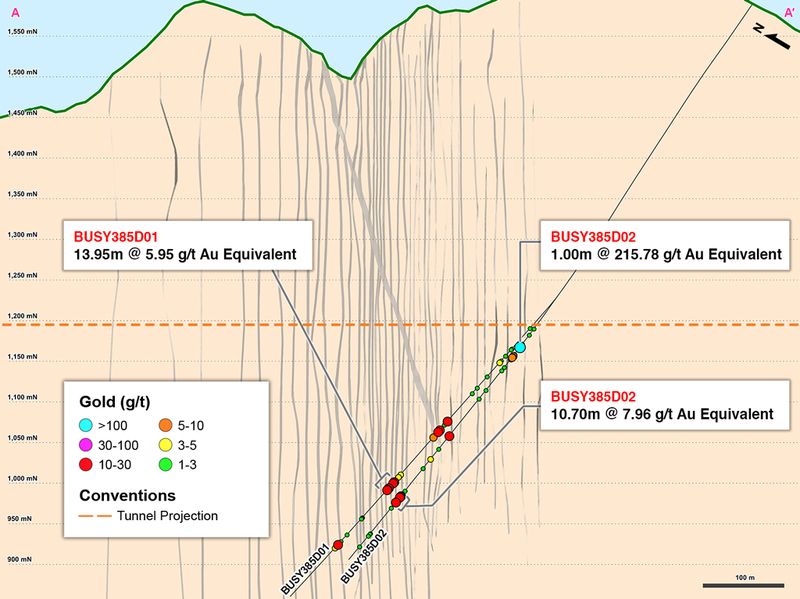 Management believes that drill holes reported herein, that intercepted BMZ2, only tested the outer margins of the structure as the orientation of the mineralization appears to be trending further south. Additional diamond drill-holes completed prior to year-end 2018 were designed to test this hypothesis and results are pending. 1.30 metres @ 94.91 g/t gold equivalent (BUSY391, 1,247-metre elevation, MU6 vein). The Yaraguá system remains open along strike to the north, east and west and at depth and will continue to be drill-tested. 3.91 metres @ 8.06 g/t gold and 32.83 g/t silver along 33 metres (northwest drift in NWSE vein). 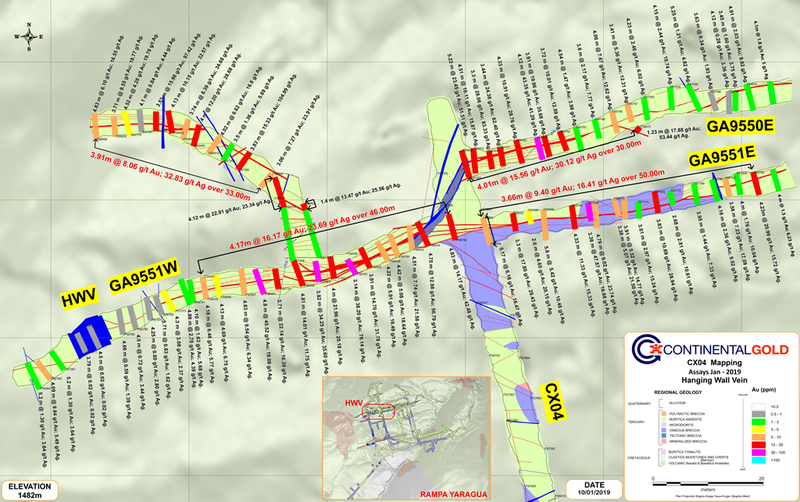 TORONTO, Jan. 15, 2019 /CNW/ – Continental Gold Inc. (TSX:CNL; OTCQX:CGOOF) (“Continental” or the “Company”) is pleased to announce additional high-grade assay results from underground channel sampling and nine holes drilled into the Yaraguá system as part of the underground mine construction and exploration drilling program at its 100%-owned Buriticá project in Antioquia, Colombia. The Company plans to drill up to 73,500 metres in 2019, consisting of approximately 55,000 metres of capitalized definition drilling and approximately 18,500 metres of infill drilling. Additionally, the Company has a significant backlog of drill holes being assayed, and the results are pending and will be reported in due course. Lastly, an updated NI 43-101 mineral resource estimate for the Buriticá project remains on schedule and is expected to be completed prior to the end of Q1 2019. Nine diamond drill holes were completed from three different locations targeting the eastern extension of the Yaraguá system. Six holes were collectively drilled from two different surface pads, while three were drilled from an underground chamber. These intercepts into the BMZ2 new discovery not only confirm its presence, but also that it hosts high-grade gold over robust widths. While it is still early days towards understanding the potential of this new discovery, the Company is optimistic that additional drilling may result in a zone, which is similar to BMZ1 further to the west, that covers 440 vertical metres and remains open for depth expansion. If proven by future drilling, BMZ2 could introduce additional mine plan flexibility and greatly increase production flexibility for future mining. Based on core inspection and subsequent refinement of the model, the Company believes that BMZ2 extends further south than where the drilling tested. 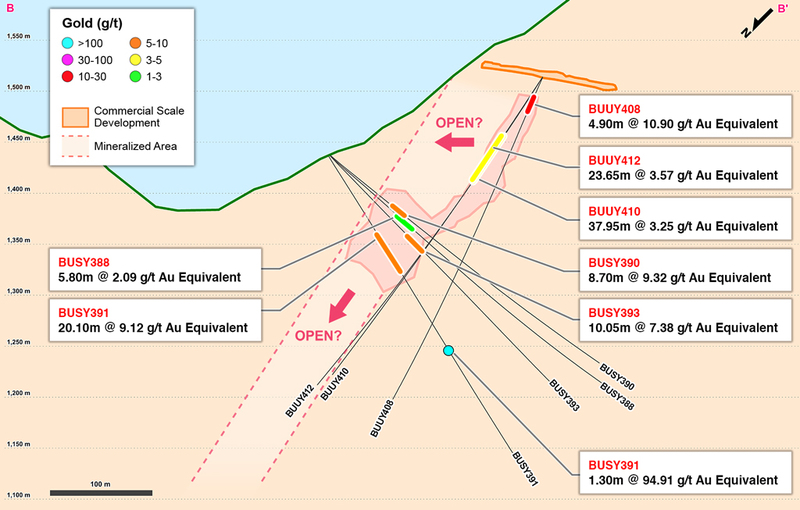 As a result, three subsequent holes (BUSY397, BUSY398 and BUSY399) were completed into what is interpreted to be the central part of the zone; assay results for these drill holes are pending and will be reported on in due course. (2) Channel chip samples are taken along the walls of the underground crosscuts and across the face of the underground drifts with vein exposures. * Intercepts calculated for minimum intervals of 0.5 metres. ** Grades herein are reported as uncapped values. Gold equivalent in this release and table was calculated at Au:Ag ratio of 75:1 with no assumptions made for metallurgical recovery rates. With a continued objective of strengthening security for the organization, the Company is pleased to announce that Captain Jairo Ivan Ariza has been appointed as Vice-President, Protection. This new position within the organization will report directly to Luis German Meneses, Country Manager, and will be in charge of all security-related strategies and initiatives for the Company. Captain Ariza has enjoyed a diverse career in both the public and private sectors. He spent 17 years (1985-2012) in the National Navy of Colombia, culminating with the rank of Captain and being a member of the Joint Naval Staff of the Navy Command. From 2013-2016, Captain Ariza worked for the National Government of Colombia within the Ministry of Defense, where he was involved in creating security-related policies and strategies to combat criminality in Colombia. Finally, from 2016 until joining Continental, he was the Director of Risk Control for AngloGold Ashanti, where he was responsible for all security and protection-related matters. Captain Ariza holds Master’s degrees in Business Administration, Political Science and Marketing and Management. *BMZ2 is a three-dimensional orebody interpretation and modelling with variability in width, thickness along a vertical extension. Additional core drilling is been planned to define its characteristics such as gold/silver grades, geometry and vertical extension. The BMZ consists of a group of modelled precious metal-bearing veins in the current mineral resource estimate block model with mineralization occurring between these veins, generally in the form of veinlets at oblique angles to strike. The majority of the mineralization between modelled veins is not in the current mineral resource estimate, providing potential upside both in terms of identifying significantly broader and more productive zones for mining and increased mineral resources. To date, the Company has identified up to seven BMZ targets for testing and will systematically drill each target zone as underground mine development advances. Underground development along the veins was sampled by trained crews under the direct supervision of mine geologists. The sampling consisted of channel samples that were taken by hammer and chisel across the full width of the face every 3 metres along strike, or along the rib of the drift continuously at selected locations. Distinct geological zones were sampled separately (vein separate from wall rock), with minimum-maximum horizontal sample widths of 0.2 to 1.0 metres. The widths of the channels were adjusted so that each sample weighed between approximately 2 to 8 kilograms. Sample locations were measured from a surveyed control point. Duplicate channel samples were collected with a frequency of one every 25 samples. Bar code tags were inserted into the individual sample bags by the geologist, including duplicates which were numbered in sequence with the primary samples. The bags were then secured with a cable tie and transported out of the mine by the sampling crew to a secure staging area on surface using a procedure supervised by the Mine Geologist and Chief Geologist. Channel samples were prepared and analyzed at Continental’s Yaraguá mine laboratory at Buriticá, Colombia. Blanks, field duplicates from each heading, pulp duplicates, check assays and analysis of results using industry-accepted best practices and certified reference standards are inserted into the sample stream to monitor laboratory performance. Channel samples were analyzed using a 50-gram gold fire assay with gravimetric finish. All silver values were determined by four acids digestion and atomic absorption method. For exploration and infill core drilling, the Company applied its standard protocols for sampling and assay. HQ and NQ core is sawn or split with one-half shipped to a sample preparation laboratory in Medellín run by ALS Colombia Limited (“ALS”), whereas BQ core samples are full core. Samples are then shipped for analysis to an ALS-certified assay laboratory in Lima, Peru. The remainder of the core is stored in a secured storage facility for future assay verification. Blanks, duplicates and certified reference standards are inserted into the sample stream to monitor laboratory performance and a portion of the samples are periodically check-assayed at SGS Colombia S.A., a certified assay laboratory in Medellín, Colombia. 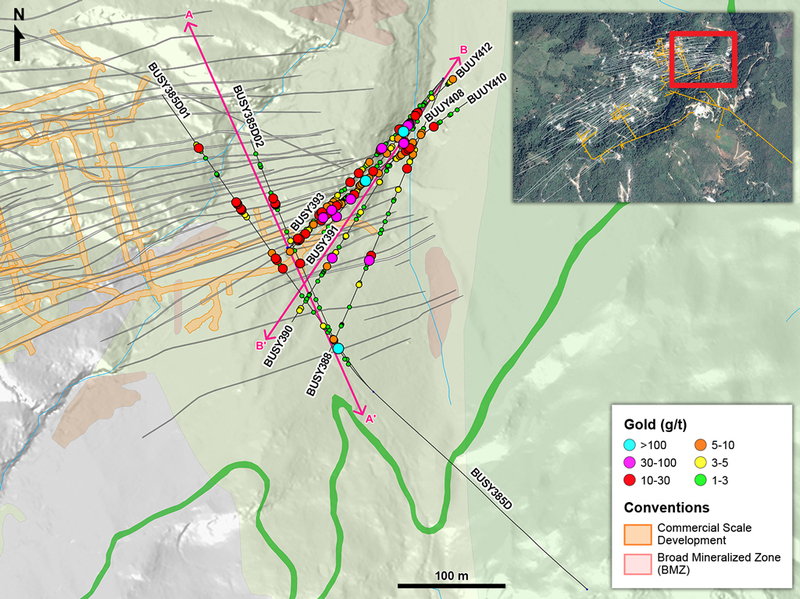 Continental Gold is the leading large-scale gold mining company in Colombia and is presently developing it’s 100% owned Buriticá project in Antioquia. Buriticá is one of the largest and highest-grade gold projects in the world and is being advanced utilizing best practices for mine construction, environmental care and community inclusion. Led by an international management team with a successful record of discovering, financing and developing large high-grade gold deposits in Latin America, the Buriticá project is on schedule with first gold pour anticipated during the first half of 2020. Additional details on Continental Gold’s suite of gold exploration properties are also available at www.continentalgold.com. This press release contains or refers to forward-looking information under Canadian securities legislation—including statements regarding: timing of drill results, an updated mineral resource estimate and mine plan and commercial production; advancing the Buriticá project; exploration results; potential mineralization; potential development of mine openings; potential improvement of mining dilution grades; reducing start-up risks; and exploration and mine development plans—and is based on current expectations that involve a number of significant business risks and uncertainties. Forward-looking statements are subject to other factors that could cause actual results to differ materially from expected results. Readers should not place undue reliance on forward-looking statements. Factors that could cause actual results to differ materially from any forward-looking statement include, but are not limited to, an inability to advance the Buriticá project to the next level, failure to convert estimated mineral resources to reserves, capital and operating costs varying significantly from estimates, the preliminary nature of metallurgical test results, delays in obtaining or failures to obtain required governmental, environmental or other project approvals, political risks, uncertainties relating to the availability and costs of financing needed in the future, changes in equity markets, inflation, changes in exchange rates, fluctuations in commodity prices, delays in the development of projects and the other risks involved in the mineral exploration and development industry. Specific reference is made to the most recent Annual Information Form on file with Canadian provincial securities regulatory authorities for a discussion of some of the factors underlying forward-looking statements. All the forward-looking statements made in this press release are qualified by these cautionary statements and are made as of the date hereof. The Company assumes no responsibility to update them or revise them to reflect new events or circumstances other than as required by law. This press release was prepared in accordance with Canadian standards, which differ in some respects from United States standards. In particular, and without limiting the generality of the foregoing, the terms “inferred mineral resources,” “indicated mineral resources,” “measured mineral resources” and “mineral resources” that may be used or referenced in this press release are Canadian mining terms as defined in accordance with National Instrument 43‑101 – Standards of Disclosure for Mineral Projects under the guidelines set out in the Canadian Institute of Mining, Metallurgy and Petroleum (the “CIM”) Standards on Mineral Resources and Mineral Reserves (the “CIM Standards”). The CIM Standards differ significantly from standards in the United States. While the terms “mineral resource,” “measured mineral resources,” “indicated mineral resources,” and “inferred mineral resources” are recognized and required by Canadian regulations, they are not defined terms under standards in the United States. “Inferred mineral resources” have a great amount of uncertainty as to their existence, and great uncertainty as to their economic and legal feasibility. It cannot be assumed that all or any part of an inferred mineral resource will ever be upgraded to a higher category. Under Canadian securities laws, estimates of inferred mineral resources may not form the basis of feasibility or other economic studies. Readers are cautioned not to assume that all or any part of measured or indicated mineral resources will ever be converted into reserves. Readers are also cautioned not to assume that all or any part of an inferred mineral resource exists or is economically or legally mineable. Disclosure of “contained ounces” in a resource is permitted disclosure under Canadian regulations; however, United States companies are only permitted to report mineralization that does not constitute “reserves” by standards in the United States as in place tonnage and grade without reference to unit measures. Accordingly, information regarding resources contained or referenced in this press release containing descriptions of our mineral deposits may not be comparable to similar information made public by United States companies.